This blog pause brought to you by…..
..a wicked head cold. Poopies. Too sick to KNIT. And OF COURSE Studmuffin is going to California for 4 days starting tomorrow….plus we have a houseguest. And it’s cold. 1) it turned out to be MAJOR surgery and I was in the hospital for three nights. 2) No cancer so far -we’ll know more on Friday- but all kinds of scar tissue and adhesions to various digestive bits along with the mass (the dr. used the term ‘cemented in’…) all of which had to be removed. 3) My mom is fabulous. 4) I am alternating resting and walking. Not in huge amounts of pain, thankfully. 5) Blog will have more knitting in it next week. So I’m on the mend from all the pneumonia and stuff, my mother has been here and gone – with plans to return on the 6th to help me for the next day’s surgery. So what do I discover? 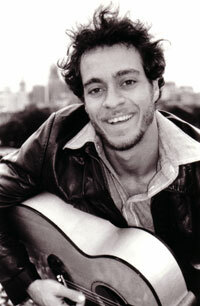 ON APRIL NINTH – AMOS LEE is performing right here in Huntsville. Oh my blessed right knee! I adore AMOS LEE. Hence, the fool that I am, I am actually considering GOING to hear him PLAY. How foolish is this? WAY WAY foolish. Now I know he’ll also be at WorkPlay in B’ham on the 13th, and WorkPlay is one of the best venues I’ve ever seen anybody in….and I will have had a few more days to heal….still it’s probably a bad idea to go, right? Friends and neighbors, please feel free to tell me how stupid I’m being in the comments. I’m like an addict – I’ve no self control…. In the last couple of months, I’ve been lucky to see 3 really good live shows: the Soweto Gospel Choir, Ruthie Foster and Shawn Colvin. Studmuffin came with me to see the Soweto Gospel Choir and Shawn Colvin; both of which took place at the Alys Stephens Center in B’ham. Both shows were terrific performances…but I’m not certain I’ll ever want to go back to that venue…unless it’s for opera or something classical. It’s a lovely looking place, the acoustics are very good but there’s a very “dead” energy there. 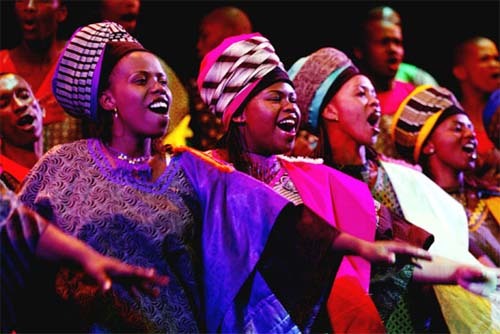 The Soweto Gospel Choir had difficulty getting people in the audience to respond to the music with clapping; certainly no one got up to *dance*. And if they couldn’t do it – NO ONE can. 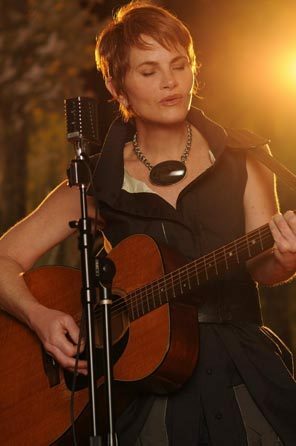 We had wonderful seats for the Shawn Colvin concert and she was great, even though she had a cold. Not only can she REALLY sing AND play, but she re-tuned her guitar (a be-yoo-tee-ful Martin) about 5 times to alternate tunings BY EAR. That was simply (insert yer favorite expletive here) amazing! David Wilcox, another singer-songwriter we are fond of and uses quite a few alternate tunings, used a nifty tuner attached to his mike stand when we saw him. The Ruthie Foster show was here in Huntsville at the Merrimack Hall and that was completely delicious. The hall was great and sold out and she was magnificent. 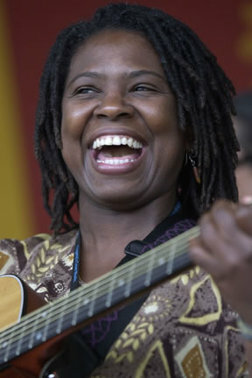 Ruthie Foster is a National TREASURE y’all. (good) Live Music = HAPPINESS! 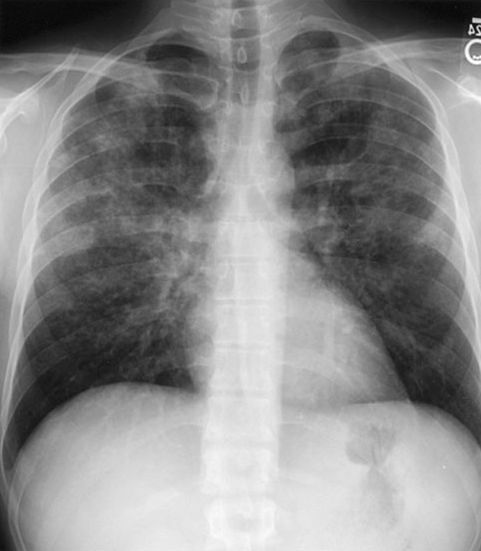 Think back just a few days ago when I was just merely sick with the flu; I’ve since been diagnosed with pneumonia. Not bad enough to slap me into the hospital, but bad enough for me to ask my family to come back early from West Virginia. The giant pills I’ve been taking are working – I *am* better – but I am still coughing BIG. So whilst I was unable to sleep lying down because of all the fluid in my lungs, I watched some tv and spent hours on the ‘puter. One would think that this would be a great time to catch up with my Google Reader and read those 1000+ blog posts that have been piling and piling up. But NO! This did not occur….because, friends and neighbors, I was too sick to knit – even”stupid knitting” was beyond me – much less read and comprehend blog posts. Also, it seems this situation on GR is intimidating me: I haven’t been reading the posts because I am afraid to start reading and get “sucked in” to the ‘puter, and yet I am also afraid to unsubscribe to a single blog to reduce the number of posts. So I have decided that I must start scheduling GR time and create a new habit, like if I spent 20 – 30 minutes daily reading the newspaper, I will now spend 20 – 30 minutes reading blog posts. My 40th birthday will be Saturday, December 13th. I’m pondering what this means to me. I’m pretty sure that I’ve lived more than half my life already – I smoked like a chimney for years (I quit 14 years ago – YAY!) and although I eat very healthily these days and get regular exercise, I remain very fat. Don’t get me wrong – I’d rather be fat than still smoking (I was less fat as a smoker)! I guess my only true regret is having to deal with these mysterious allergies that have been pestering me for the last year. I wanna be forty and fabulous, but mostly I’m forty and wheezy. Other than that and some peri-menopause woes, I’m pretty good healthwise and that is such a blessing!! I ‘ve known quite a few people in the last 3 years especially who have had cancer (and not everyone has beat the disease unfortunately) and so much of your life goes on hold when you are ill. The daily challenges are SO much harder when your health isn’t good and I am so thankful. But it could all end tomorrow – and I guess that’s OK too. I would like to see the kids all grown and happily settled into adulthood, but none of us know what tomorrow brings, do we? I’ve got lots of wonderful yarn to knit*…life is good! He’s gonna have to deal with being a teen heartthrob forever, and he seems like a pretty decent guy who’s rather serious about acting. 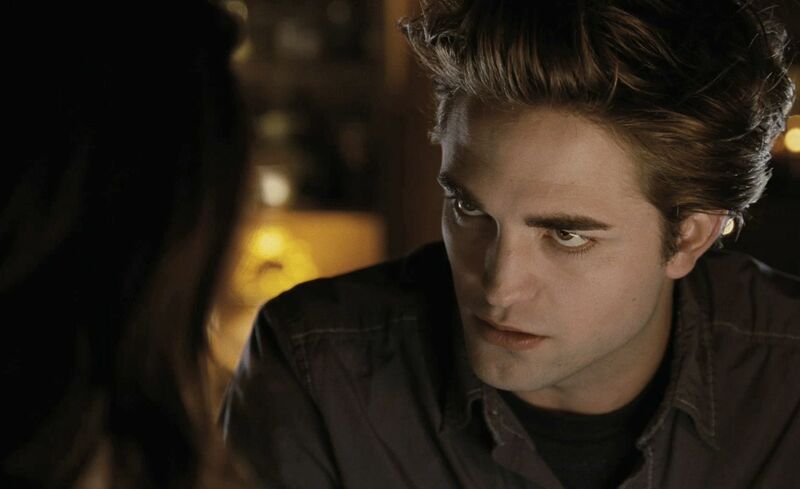 He does quite a fine job in Twilight with a very difficult character, but he’s got a lot of learning to do before he becomes a great actor; it would be a shame if his admittedly very nice looks overshadow his acting for always. AND I’m sure the female fans will make his life a misery off and on for the rest of his life – I’m sure he had no idea that Twilight was gonna be so freaking huge! Fortunately, he’s a Brit and that may keep him from some of the crazy excess of egomania that is such a manifestation of Hollywood.